"AMAZING ENERGETIC SETS FROM JESSIE J, JAMES BAY, THE SCRIPT AND HEADLINERS STEREOPHONICS DELIGHT THE CROWD AS THE FESTIVAL’S FIRST DAY DRAWS TO A CLOSE"
Over on the King Tut’s Powered by Utilita Stage, The Slydigs began proceedings with a huge sound and amazing energy. Glasgow band The Ninth Wave cemented their place as one of the country’s best live bands while SamFender proved just why he’s one of 2018’s most promising live acts. Anteroswere up next with frontwoman Laura Hayden owning the stage with her incredible vocals and style. Marmozets brought the heat as the sun remained bright in the sky and Pale Waves delivered a brilliant penultimate set with their hit-laden setlist and enigmatic frontwoman Heather Baron-Gracie. King Tut’s Powered by Utilita Stage Friday night headliner Tom Walker showed the standard south of the border is just as strong as up here in Scotland, paying special tribute to his Gran’s very first appearance at a festival! Stopping to ask the crowd to serenade the band's drummer with a rendition of Happy Birthday, Kelly had the crowd in the palm of his hand. 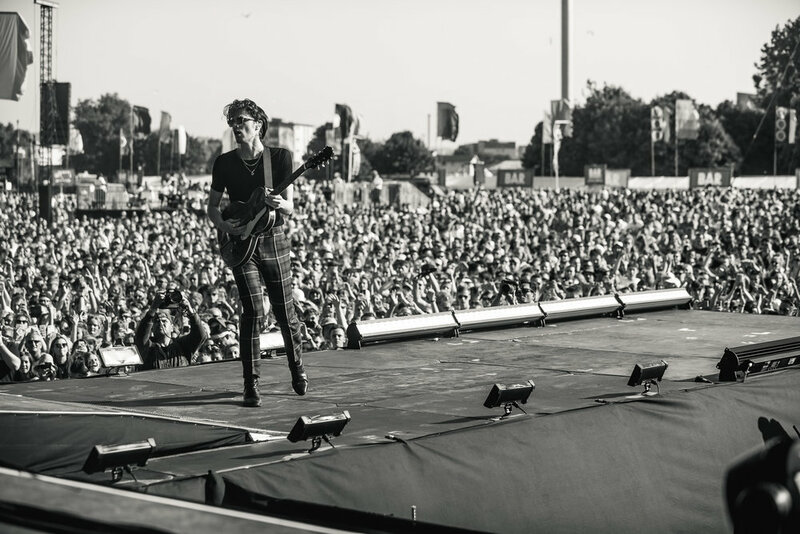 As ‘Dakota’ was belted out into the TRNSMT crowd, huge sing-alongs filled the air around Glasgow Green and as their epic set drew to a final crescendo of excellence, the Welsh rock icons were treated to a roar only a Scottish crowd could produce.